Telomeres are an emerging area of genetic research with many new studies being published that highlight fascinating results. Telomeres reside at the end of each chromosome in our bodies. They have no genetic function and are simply stretches of DNA that protect the rest of the chromosome. However, these little bits of DNA, or telomeres, are critical to healthy cell function. They become shorter each time the cell divides. Telomere shortening means the cell’s lifespan is also decreasing. Recent research shows that decrease in telomere length plays an important role in human disease and mortality with many studies showing associations between shorter telomere length and various types of cardiovascular disease, cancer, osteoporosis, cognitive function, dementia, and arthritis. On the flip side, long telomeres are related to healthy aging and overall longevity. It is well known that exposure to second hand smoke is harmful to a young child and can influence long-term health but what about the socioeconomic status of the neighbourhood the child lives in? Can a child’s telomere length and by extension, their well being, be affected by the stress of living in an area considered ‘neighborhood disordered’? That’s a term used to refer to crowded, low income neighborhoods with higher poverty, unemployment and crime rates, as well as noise and safety concerns. One group, from the Tulane University School of Public Health and Tropical Medicine, investigated the connection between children’s exposure to community level stress and the cellular response to these stressors. The objective of the research was to explore the utility of salivary telomere length (sTL) as an early indicator of neighborhood level social environmental risk during child development. Children aged 4-14 were recruited from 87 neighborhoods through five urban schools in New Orleans, LA. Study staff collected DNA from saliva using Oragene and sTL was determined using quantitative PCR. The results suggest that children living in neighborhoods characterized by high perceived disorder were more than three times as likely to have low sTL values compared to children not living in high disordered neighborhoods. This study is the first to demonstrate that neighborhood level disorder and poverty are associated with lower sTL values in children. This research extends the growing literature that links early adversity and stress to accelerated TL decline in adulthood. DNA collected using Oragene/saliva collection kits showed consistent TL measurements as compared to alternative peripheral sources of DNA in youth and adults. The findings also suggest that neighborhood disorder and neighbourhood poverty are viable targets for prevention effort, focused on reducing the lasting impact of stress exposure in children’s health outcomes. Does this mean that living in a disordered neighborhood as a child can have a permanent impact on health? Not necessarily, as research is demonstrating that positive health behaviours such as exercising, eating a healthy diet and reducing psychological stress may influence how quickly our telomeres shorten or lengthen. So it appears there may be actions individuals can take to protect telomeres and by association, long-term health and longevity. The results of this study suggest there could be great implications for public policy on urban living for creating neighborhoods that do not impact children’s telomeres in a negative way. The outcome of the research also indicates that salivary telomere length represents a biological marker of psychosocial stress. The findings were consistent with previous studies in adults demonstrating a strong link between psychosocial stress and TL obtained from peripheral blood. This is also consistent with previous studies in youth demonstrating an association between early life stress and sTL obtained from buccal cell DNA. These studies offer increased support for the hypothesis that sTL represents a non-invasive biological indicator of psychosocial stress exposure, applicable even in young children. This study demonstrates that DNA from saliva, collected with Oragene, is a viable option for telomere research projects. If you are thinking of using DNA from saliva for your next research project, click here to request evaluation kits. 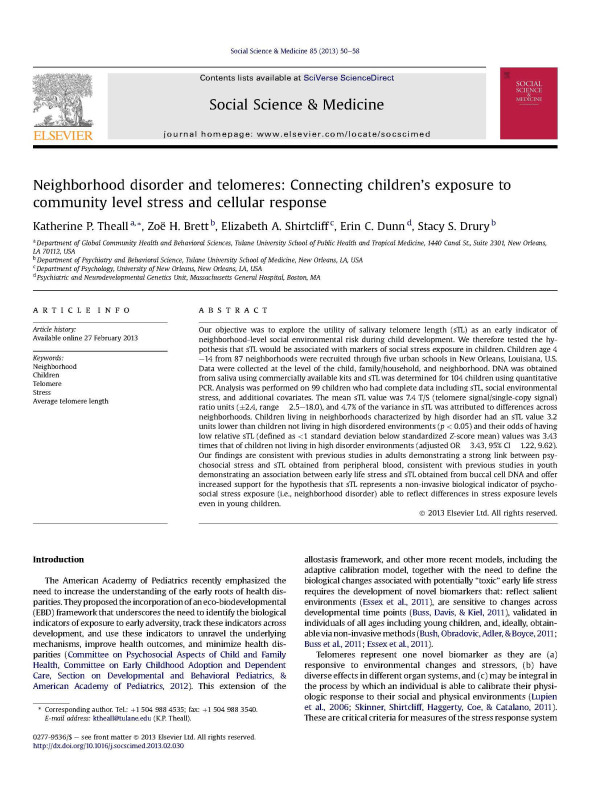 Theall, K.P., Brett, Z.H., Shirtclif, E.A., Dunn, E.C., Drury, S.S., Neighbourhood disorder and telomeres: Connecting children’s exposure to community level stress and cellular response, Social Science & Medicine (2013), doi: 10.1016/j.socscimed.2013.02.030.